When considering the MSI 990FXA-GD80 as a product to purchase, it comes with its highs and its lows. On the bright side, we have a good performing system that comes with a mountain of extras in the box compared to other products, and the BIOS is a great system. However, it becomes slightly negative if you want to overclock a Bulldozer, or want any distinct control over the fans. Users should update their launch BIOSes to F5 or later to take advantage of that new BIOS system, and flashing the BIOS is very simple through the Live Update 5 software provided. Unfortunately the BIOS does not show the user what is auto for voltages, so a little insight is needed when changing these options. There was also a minor problem with my AMD 5850 graphics cards, spinning up to 100% for a few seconds after boot, but this did not happen with my NVIDIA 580 test cards. Performance wise, nothing stuck out like a sore thumb and the MSI 990FXA-GD80 kept up in pace with the other products we have tested. For $195, and the bonus in the box, the MSI 990FXA-GD80 is a nice board to run at stock, or a good one to have with a Thuban based processor. As the cheapest board in our test, it was fair to assume that perhaps the TA990FXE would not amount to much when in came to a direct comparison with the other boards in this review - with $50-$100 difference, it was to be expected. On some levels of testing, it shows - the layout isn't optimal, the DPC Latency is hideous compared to the other boards, there are not many fan headers and there is an odd choice of network controller. 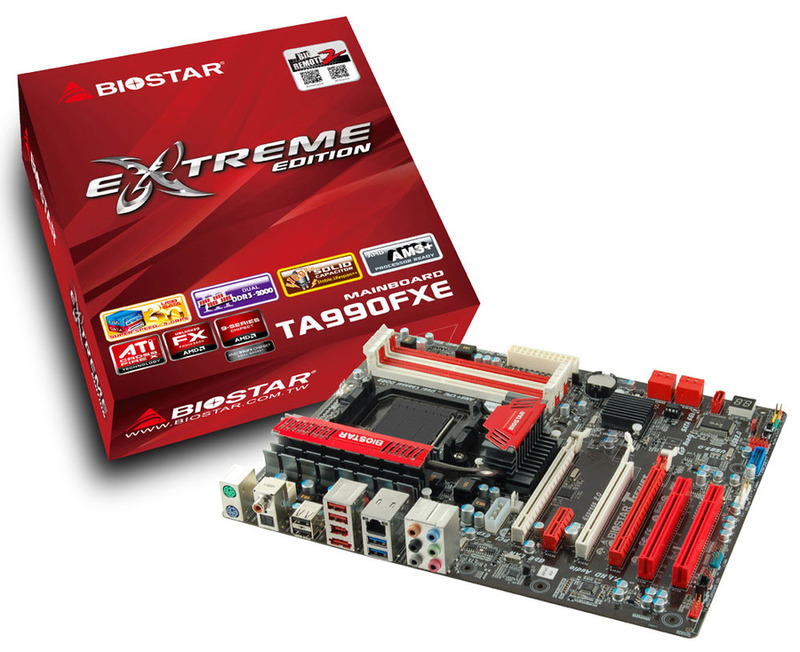 However, the Biostar TA990FXE came across as pleasantly surprising. The BIOS works well (even if the options are sometimes in confusing places), it overclocks Bulldozer on par or better than some of the other boards and comes with more kit in the box than expected. Performance wise it doesn't break into the top half much when discussing CPU benchmarks, however it has a relatively decent showing in the GPU benchmarks. Essentially, this is a board for people who just need something cheap to run their processor. It fits that niche quite well, especially if you only have one GPU and need a PCI slot or two. While the Biostar TA990FXE isn't the best board in the world, and it could use a little insight and design change to be consumer optimal, it is a cheap board that works. This combination review has been a long time coming, repetitively pushed back by other releases or events. However we have now crossed through the land of 990FX, examining boards ranging from $130 to $215, and there is a lot to choose from. Each of the boards can be separated by styling, by BIOS function, any by software utilities. As a direct minor evolution of the 8-series for Bulldozer, it does seem amazing that some motherboards really take to Bulldozer like an old friend, while others prefer it left alone running at stock speeds. Each board can have its own minor flaws; however one major flaw comes across most of the range - about which CPU temperature sensor to believe when it comes to determining fan speeds. Using HWMonitor, on some motherboards it would report ~14ºC at idle and the CPU fan would be slow, and on others it would be around 30ºC, a more realistic number. This all comes down to whether the system will read the onboard CPU temperature, or a different sensor placed on the board specifically for reporting different temperatures. This aside, each board has its plus points. If I was a gamer, the ASUS ROG Crosshair V Formula would be my major priority - as it was the board AMD prioritized for Bulldozer release, it is tweaked to run as best as it can. For fan control and performance, nothing comes close to the ASUS Sabertooth 990FX. The Gigabyte 990FXA-UD5 took advantage of that alternative CPU temperature reading and reduced my CPU fan to off or almost off at idle, resulting in a near silent system. The MSI 990FXA-GD80 performs well with a Thuban and provides a nifty USB 3.0 bracket in the box. The Biostar TA990FXE represents full sized ATX on a budget with AMD that is easy to update. If I were to take one, money no object, then I would plunge for one of the ASUS boards.